The world headquarters for Whole Foods Market spreads out across a vast, capacious megaplex in Austin, Texas, not far from the Colorado River. On the surface it looks like business is booming. But late last week, the Washington Post reported that Whole Foods is experiencing its worst performance in a decade. Sixteen months ago, the giant natural and organic foods retailer boasted it would expand from 470 U.S. locations to more than 1,200. Now, the Post reports, Whole Foods is closing nine stores in the wake of six consecutive quarters of falling same-store sales. What’s hurting Whole Foods? Ironically, it’s the popularity of organics. Organics are everywhere, from small markets and general stores to monolithic conventional retailers like Walmart. Whole Foods’ claim to fame, once a niche, is now ubiquitous. “Organic products are now available in nearly 20,000 natural food stores and nearly 3 out of 4 conventional grocery stores,” the USDA’s Economic Research Service reported on its website. In the early days of the organic movement, organic products were the lifestyle choice for a small share of consumers. Today, organics are consumed by a majority of Americans. One of the first events I ever attended when I started at the Co-op 17 years ago was a panel discussion on organics, then just a burgeoning movement on the brink of bigger things. At the time, you could only find organics en masse at food co-ops. But speakers predicted that day that organics would one day lead the food industry. They were right. 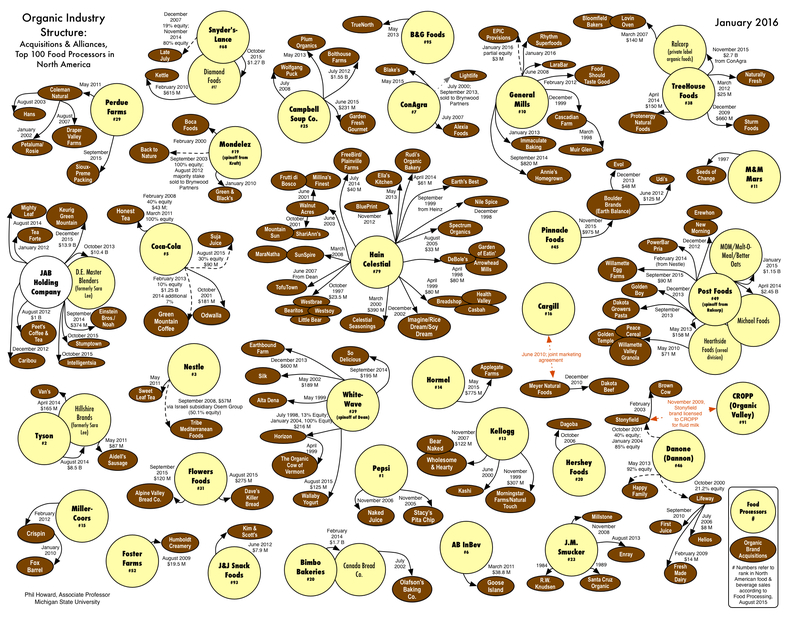 Each year, Dr. Phil Howard and folks at the Cornucopia Institute release updated versions of the popular chart, “Who Owns Organics.” (For a high-res version, click below.) Howard is an Associate Professor in the Department of Community Sustainability at Michigan State University and a member of International Panel of Experts on Sustainable Food Systems. The Cornucopia Institute is a Washington state-based watchdog group focused on organic and local agriculture. As mega companies swallow up small organic producers, and large grocery chains compete for a piece of the organic pie, some retailers are losing their competitive edge. But at many food co-ops, the situation is different. Cooperatives and organics are still a thriving partnership. Co-ops believed in organics long before others jumped on the bandwagon, and co-ops are still true to what the organic movement stands for. As a result, today, even as organics are available everywhere, many consumers still look to the local food co-op first. Our stores did $11.8 million in sales of organic items in 2016, up from $10.8 in 2015. We flag organic items as those that qualify for the USDA Organic seal, meaning the product contains at least 95 percent organic ingredients. Dot Benham, Co-op Perishables Merchandiser, agrees. Dot says the growing popularity of organics has been good for co-ops. She believes the cooperative movement’s embrace of the organic movement decades ago created a robust, sustainable partnership for both movements.